Gaye Stewart was the last Toronto Maple Leaf to lead the NHL in goalscoring: in 1945-46 he finished the season with 37 goals. Maybe that’s how you know the name. He was also the first NHLer to win a Stanley Cup before he won the Calder Trophy as the league’s best rookie, long before Danny Grant, Tony Esposito, or Ken Dryden got around to doing it. The Cup came in the spring of 1942, when he was 18; the Calder came the following year. 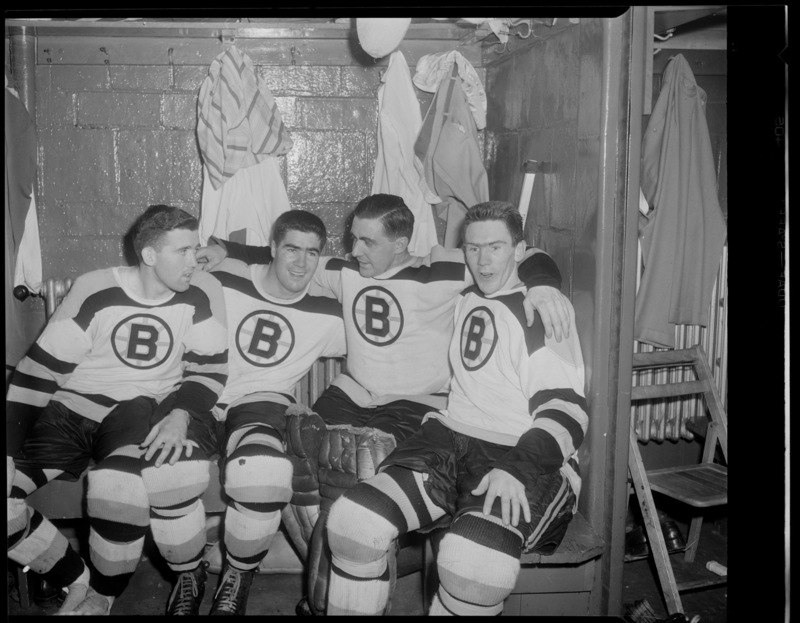 He won a second Cup with the Leafs in 1947, then later the same year found himself on his way to Chicago in the big trade that brought Max Bentley to Toronto. Stewart did fine for himself in Chicago, even as the team struggled. 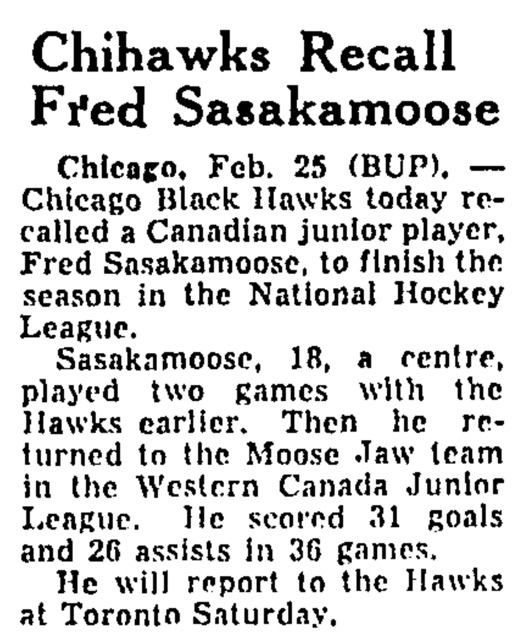 He was named captain of the Black Hawks for the 1948-49 season. 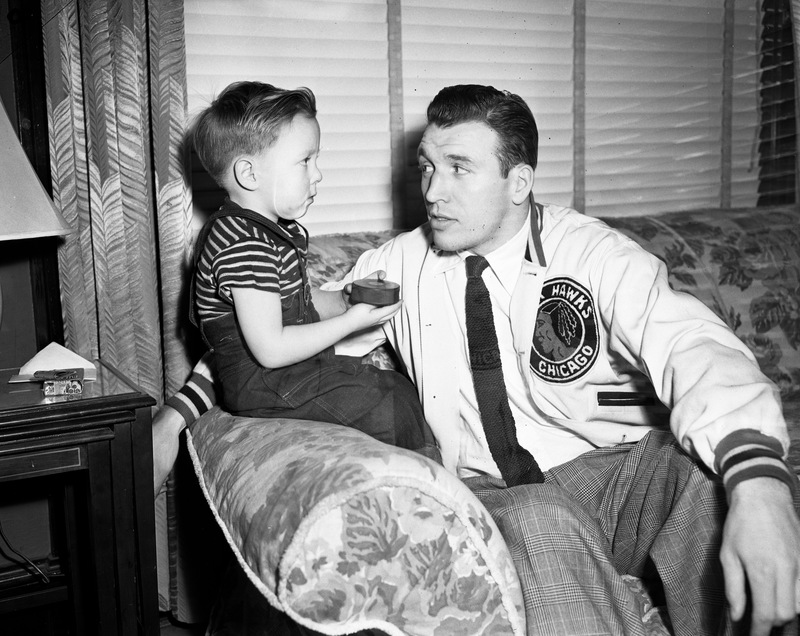 It was in January of ’49 that he was photographed, above, with his goaltender’s son: Tom Henry was Sugar Jim’s two-and-a-half-year-old. The ex-Leaf left winger was struck over the right eye by a puck lifted by Garth Boesch as the Toronto defenseman attempted to clear down the ice. Stewart returned to action after a brief rest but collapsed in the shower after the game. After being removed to the Gardens hospital, his condition became so serious that a rush call was put in for an ambulance and arrangements made for an emergency operation. Fortunately the player rallied soon after reaching Toronto General Hospital and surgery was not necessary. His condition was much improved last night [January 9], with the injury diagnosed as a bruise on the brain. Stewart said that he when he returned to action in the game he felt tired. He remembered his mates coming into the dressing after the game, but then blacked out until he woke up in hospital. There wasn’t much news, after that, of Stewart’s head or his recovery — not that made it into the newspapers, anyway. It was three weeks or so before he returned to play, back in Toronto again at the end of January, having missed six games. The two teams tied this time, too, 4-4. They met again in Chicago the following day. The Black Hawks won that one, 4-2, with Stewart scoring the winning goal. All in all, it was ended up another fruitless year for Chicago. When the playoffs rolled around in March, they were on the outside looking in for the third consecutive season. When Tribune reporter Charles Bartlett buttonholed coach Charlie Conacher before he departed for Toronto, he asked him how he felt about his players. 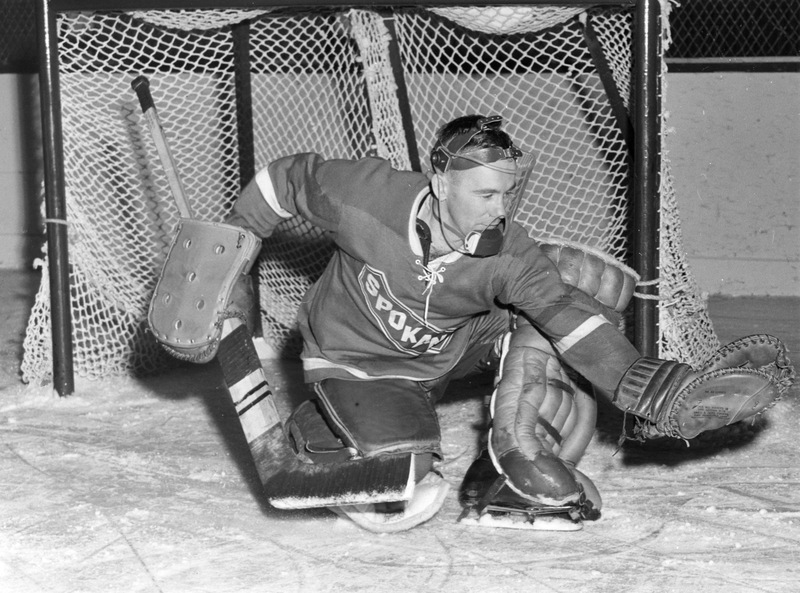 Goalie Jim Henry will join with his Ranger rival, Chuck Rayner, in operating their summer camp in Kenora, Ont. Red Hamill will go a talent scouting tour of northern Ontario. 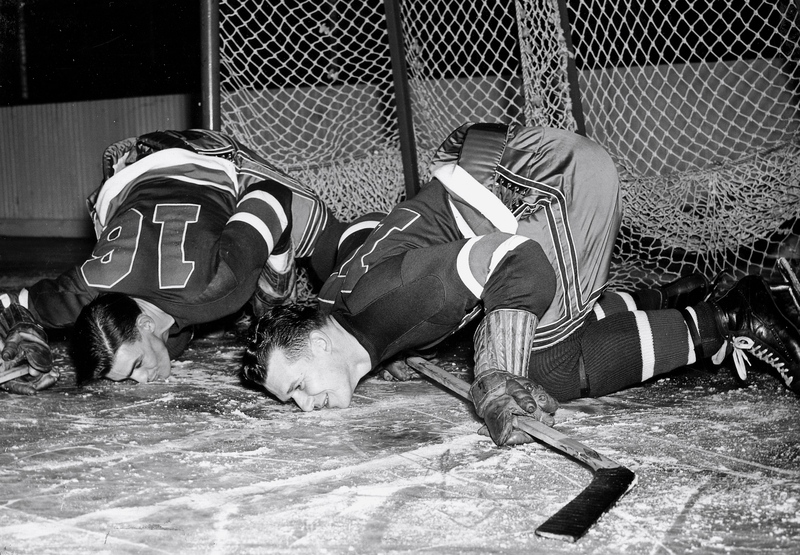 Doug Bentley and brother Max of the Leafs will play baseball and run their ice locker plant in De Lisle, Sask. Mosienko will return to Winnipeg, where he owns a bowling center with Joe Cooper, former Hawk defenseman. Roy Conacher, who received a substantial bonus from the Hawks for winning the league’s scoring title, is headed for Midland, Ont., where he plans to open a sporting goods store. Gaye Stewart will run a soft drink agency in Port Arthur, Ont. A fish business will occupy Ernie Dickens in Bowmanville. Doug McCaig is enrolled in a Detroit accounting school. Adam Brown will assist his dad in their Hamilton filling station. I’m not old enough to have memories of Fleming Mackell’s career on ice, but I’ve looked him up, so I can tell you that his hockey adjectives include hustling (left winger), husky (kid), stocky (youngster), black-haired (Bruin centre), high-scoring (ditto), aggressive little (ditto), flying (Fleming Mackell), and starry (veteran). Those all date back to the 1950s, Mackell’s heyday as a player. 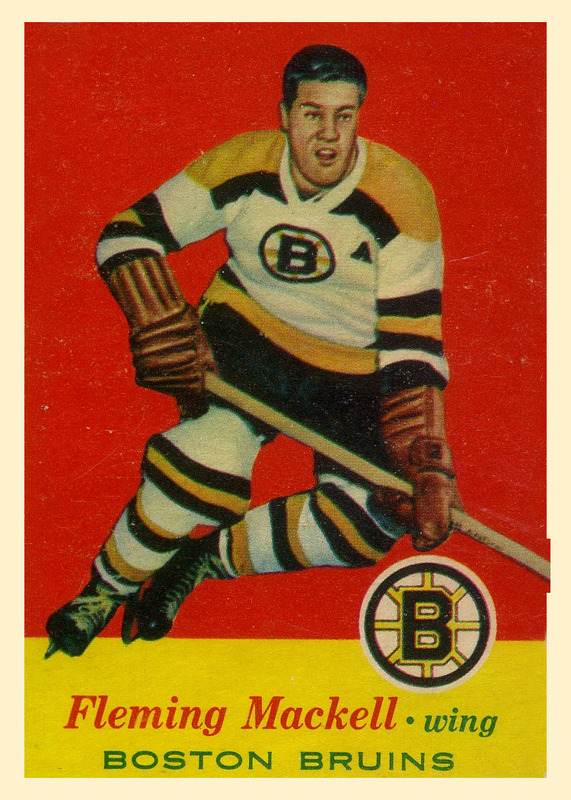 Born in Montreal in 1929, he skated for the Toronto Maple Leafs before a trade took him to the Bruins. 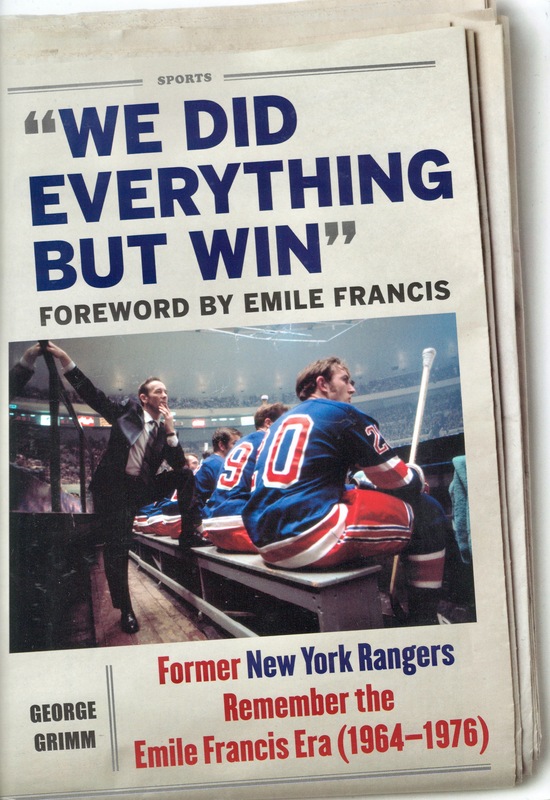 He was in Conn Smythe’s doghouse is what you’re going to see written, if you dig into that. 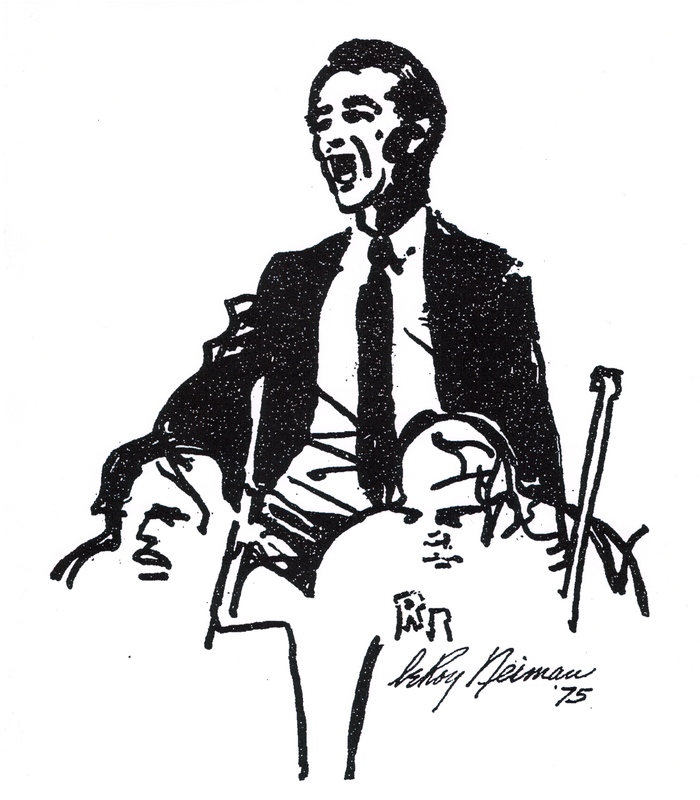 He was 86 when he died last week, on October 19, in Hawkesbury, Ontario. Dave Stubbs has a tribute worth a while at The Gazette, over this way. Otherwise, what I can tell you is that Mackell was poison to Montreal in the 1957 Stanley Cup Finals (scored a lot of goals on them); that The Flame was a nickname he went by, or at least one that newspapermen used; that Johnny Peirson and Ed Sandford were his linemates in Boston in 1953. Later (1958) he centred Jerry Toppazzini and Real Chevrefils. Taking a relay from Sandford in the Boston end, Fleming set sail down the left Peirson far over on the other side as a decoy. 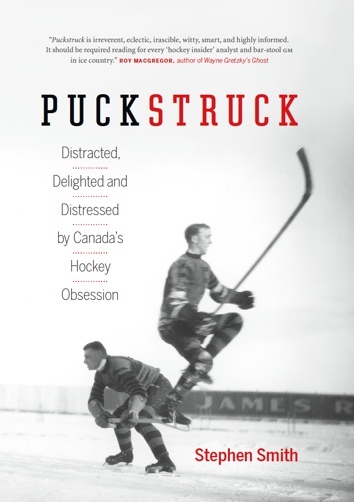 When he weaved into a spot about 40 feet from the goal, the shifty little center made a kind of fake, then whistled a wristy shot that sent the puck knee high past Sawchuk into the far side. His father was Jack Mackell, who played on the wing for the Ottawa Senators in the 1920s, which makes the Mackells two of a scarce breed, father-and-son combinations to have played in the NHL. Not only that: they both won Stanley Cups: Jack in 1920 and 1921, Fleming as a Leaf in 1949 and 1951. Why aren’t their surnames ever spelled the same, when you look them up? That’s a longstanding error, worth addressing in a separate post; stay tuned. Fleming was playing in the Quebec Junior Hockey League by the time he was 15. 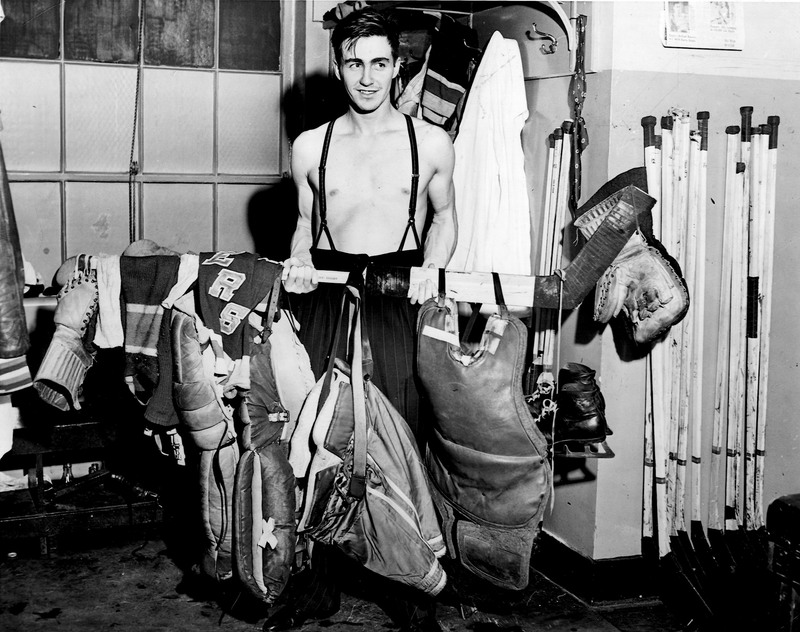 He took a scholarship to St. Michael’s College in Toronto, and from there graduated to the Leafs in 1948. Eight-and-a-half years he played for the Bruins before they decided he didn’t fit their plans any more. They wanted to trade him, he said he wouldn’t go: that’s how he ended up as a playing coach for the Quebec Aces in the American Hockey League. That didn’t really work out — “a big mistake,” Mackell called it — and after several more seasons in senior hockey, he stashed his skates away for good. Canadian newspapers picked up the American news, as you’d expect they might, when Mackell was shot by a woman in his car in Miami while on vacation, but the story faded away while Mackell was recovering, satisfactorily, in hospital, without explaining the argument or whether or not anybody went to jail.